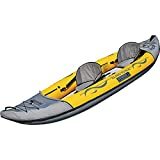 Amazon Price: N/A $399.00 (as of – Details). Product prices and availability are accurate as of the date/time indicated and are subject to change. Any price and availability information displayed on the Amazon site at the time of purchase will apply to the purchase of this product. If you're ready to have some fun on the water the compact and durable Island Voyage 2 from Advanced Elements is the kayak for you! The pointed bow, rocker profile, and removable deep tracking fin provide excellent performance, while high volume side tubes offer unparalleled stability and buoyancy. Heavy-duty polyester tube covers and PVC Tarpaulin hull provide bombproof durability. Featuring several grab handles and plenty of storage thanks to bungee deck lacing, this kayak is ready for fun filled days. The adjustable high-backed seats provide comfort and three seat attachment points allow you to paddle this boat as a tandem or solo. Whether you're floating the river or paddling the local lake, you will love the fun and functional Advanced Elements Island Voyage 2!